Seman Violins (4447 W. Oakton, Skokie). A family friendly workshop will begin at 5:30pm followed by the regular workshop at 7pm. * Present a ticket stub from Arto & Antti’s concert at the Old Town School of Folk Music on Sunday. Click here for information and reservations on what is sure to be a fabulous show. Top ten reasons why you don’t want to miss this workshop. 9. Arto’s first two visits were awesome. 7. 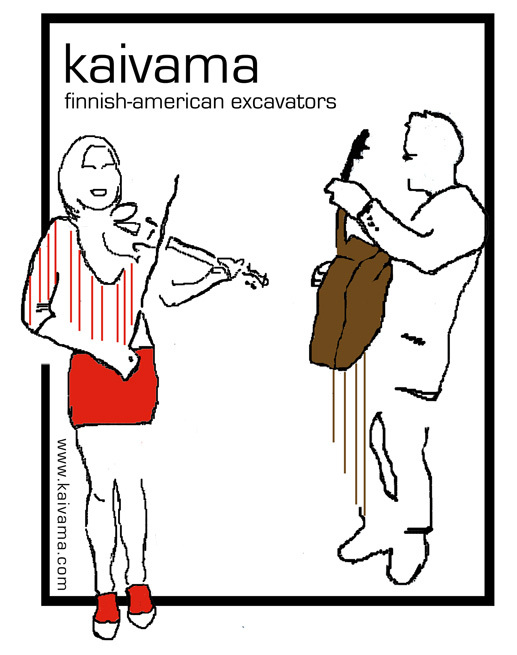 Finnish fiddling is both archaic and contemporary. 6. 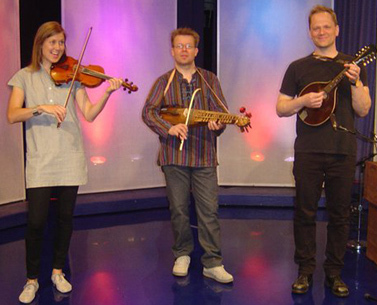 Järveläs have been playing the fiddle for at least 7 generations. 5. Antti is a really friendly guy. 4. This will be a load of fun. 3. Antti and Arto are awesome musicians. 2. Arto is one of Fiddle Club’s best friends. 1. 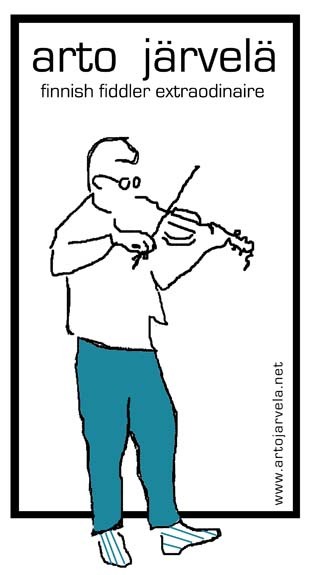 Did I mention that Finnish fiddling is awesome? ** Check out these previous Fiddle Club posts (or just click Arto’s name in the tag cloud in right hand column). Check back later in case they send us more tunes. Like these . . .
Foops two polskas from Maria Spoofs manuscript collection, circa 1800. All the tunes Arto taught in September 2009 gathered onto one page . . .
From the Flog [Fiddle student blog (now defunct)], here are links to all the tunes he taught in workshops and to classes during his residency at the Old Town School in September 2009. From the Fiddle Club blog, here are the tunes he gave us in 2009. We welcome back Arto Järvelä, our good friend from Finland, for his second visit to Fiddle Club of the World. Many of us have warm memories of his residency at the Old Town School in 2009. Joining him for their second visit to the Old Town School is Kaivama, the duo of Sara Pajunen and Jonathan Rundman, from the Northwoods of Minnesota. Separately and together they have excavated many beautiful, archaic gems from the music traditions of the Finnish people, while also contributing new melodies in those ancient keys. 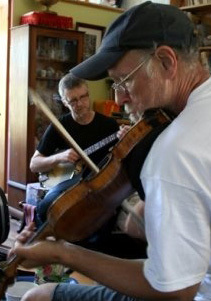 Here’s a sample, recorded during their visit in June 2011, when the three of them dropped in on my Fiddle 4 class. To learn a couple of tunes to play with Arto, click here to listen, or here for the notes. $15 dues for only this meeting, click here to register. Join Fiddle Club of the World for $60 yearly dues, support our guest artists and save 20% off the spring schedule alone. You will then have free admission for the rest of your year-long membership. Plus you get your own very cool Fiddle Club card. 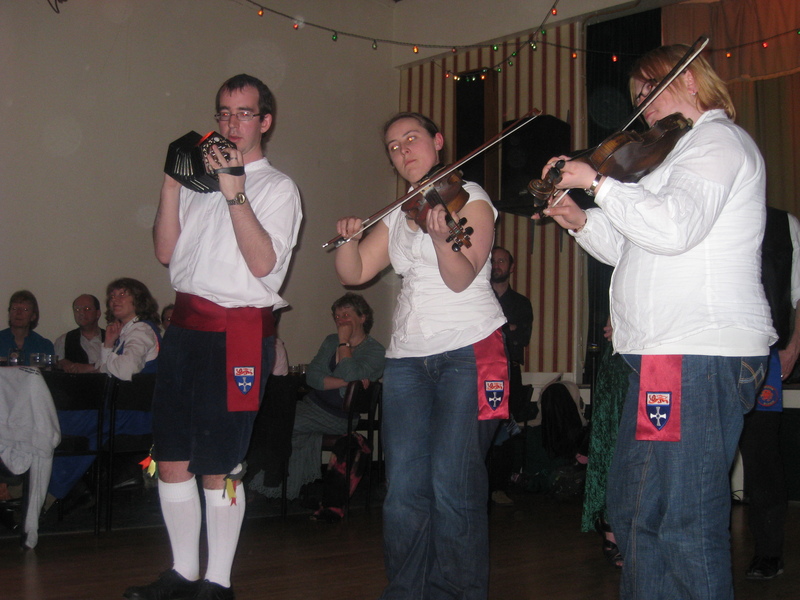 His first visit to Fiddle Club in September 2009 was a memorable night. He’d like to play some of those tunes again. I’ll post some links later this week. He also sent us a few new ones, which were posted earlier. Listen to the tunes, first and often, while learning to play them from the following notation. ABC Notation. Free software to read, print and play the ABCs is available here. And a short tutorial on ABC notation for fiddlers can be downloaded from the Old Town School’s Tune Archive using this link. With the Starc polska, I tried to notate it roughly the way Arto played it, with suggestions for ornamentation. Here is a starker (pun intended) published notation for Starc 44. Answers to questions I’ve been asked about Fiddle Club. If you have a yearly subscription, you do not need to register. 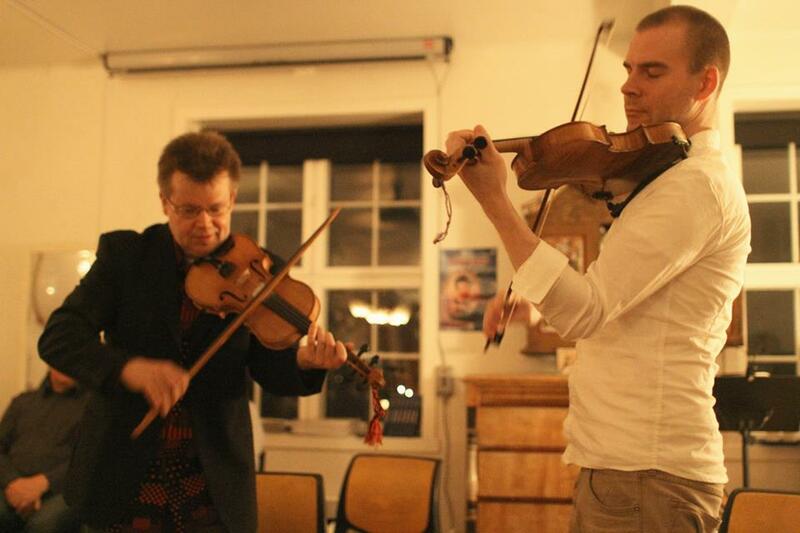 We welcome everyone who wants to hear and/or learn some Finnish fiddling. It would be great if you register online, but you can also pay at the front desk on Saturday night. 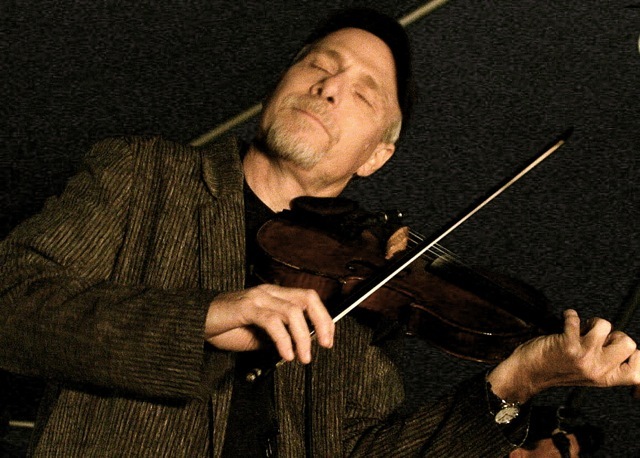 Founding fiddler of the Mamou Playboys, David Greely has assembled a repertoire of uncommon Cajun music and new companion pieces to entertain and inspire you. To learn a couple of tunes to play with David, click here. $15 dues for either of these meetings, click here. 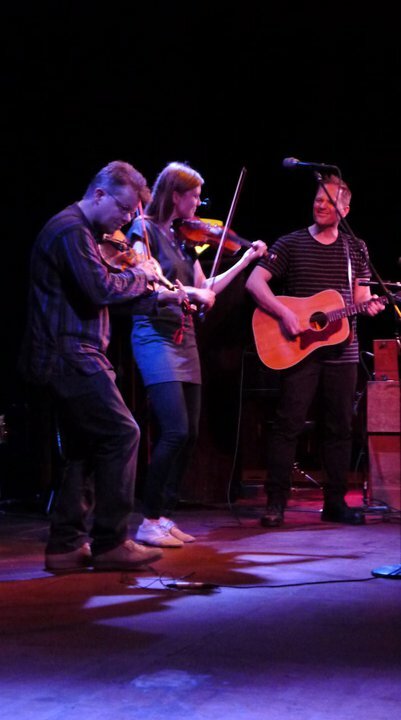 Born to a family of fiddlers from Kaustinen, the epicenter of Finnish fiddling, our good friend Arto Järvelä makes a return to fiddle club, bringing with him Kaivama, the Minnesota-based duo of Sara Pajunen and Jonathan Rundman, for their second visit to the Old Town School. To learn a couple of tunes to play with Arto, click here. 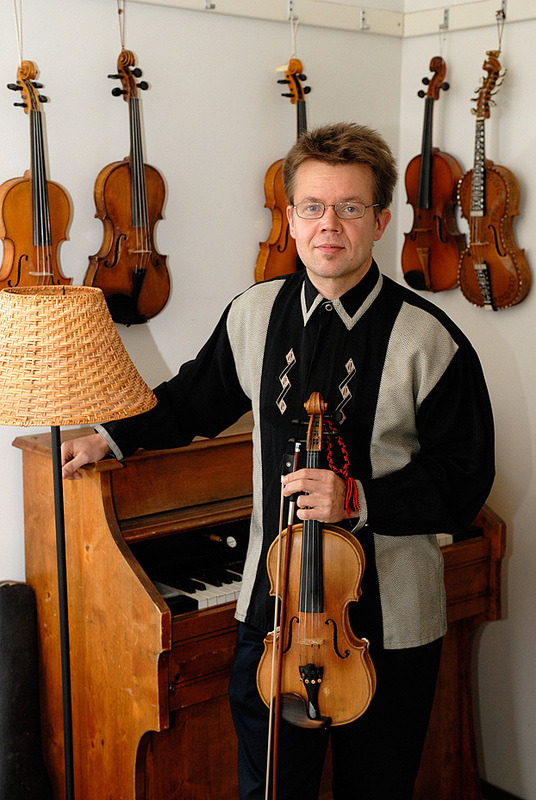 Arto Järvelä is the first Fiddle Club of the World guest to make a return appearance. Along with Kaivama, a duo from Minnesota, he will be perform at the Fiddle Club meeting on Saturday, March 3rd at 7:30pm in room E324 in Old Town School East (4545 Lincoln). He’s looking forward to another good jam session after their concert. Here are some tunes to work on. 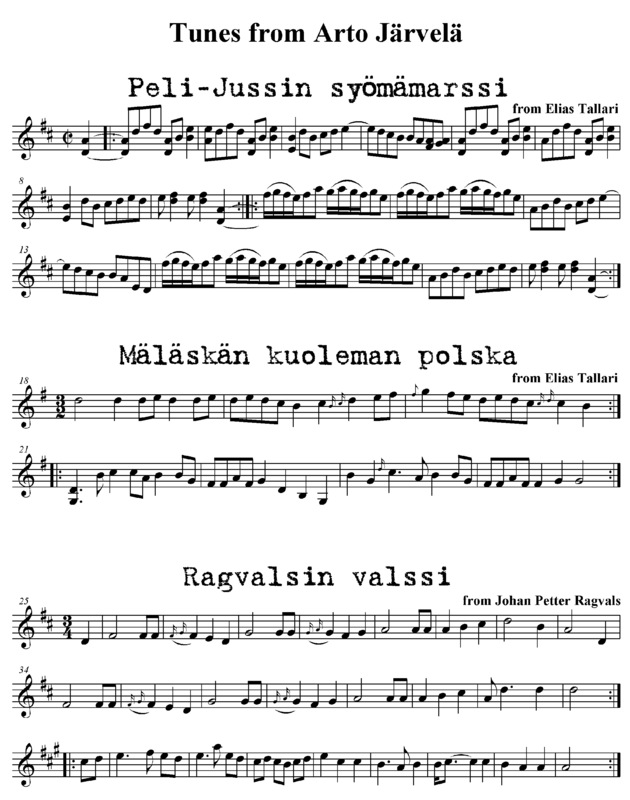 An ancient polonaise or polska in triple time that Arto learned from a 1806 manuscript collection kept by Adolf Frederik Starc (or Stare) in Turku, the old capital city of Finland. For notation to some of these tunes, click here. 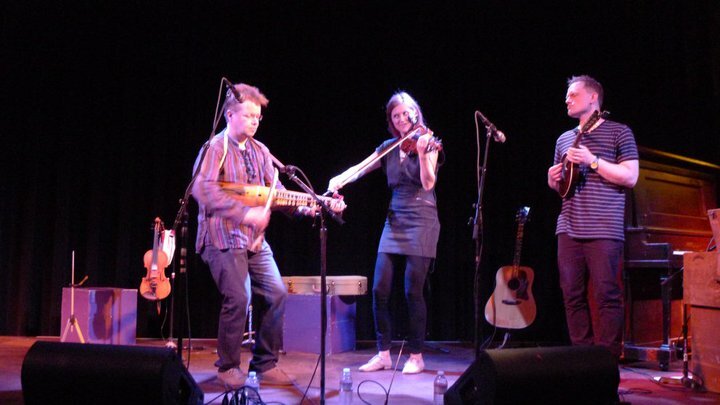 You might also want to check out the tunes Arto gave us for his last Fiddle Club appearance in September 2009. Click here. Plus, here is a new super-link to all the tunes he taught in workshops and to classes during his residency at the Old Town School in September 2009: DrDosido.net. Dues for the March 3rd meeting are $15 – you can register here (03/03/12). Save money with a yearly subscription of $60. It gives you admission to all Fiddle Club events. Arto Järvelä is a world-class musician from Järvelä, a small village just across the Perho River from the slightly less smaller town of Kaustinen, seismic center of the Finnish Folk Music explosion of the last few decades. Arto’s grandfather Johannes led the Järvelän Pelimannit (Järvelä Village Fiddlers) through the 1970s. Since then, Arto has made a name for himself as a solo fiddler and as a member of many important folk bands, such as Pinnin Pojat, the Helsinki Mandolinners and Nordic Tree. He perhaps is best known for JPP (short for Järvelän Pikkupelimannit, or little village fiddlers band). 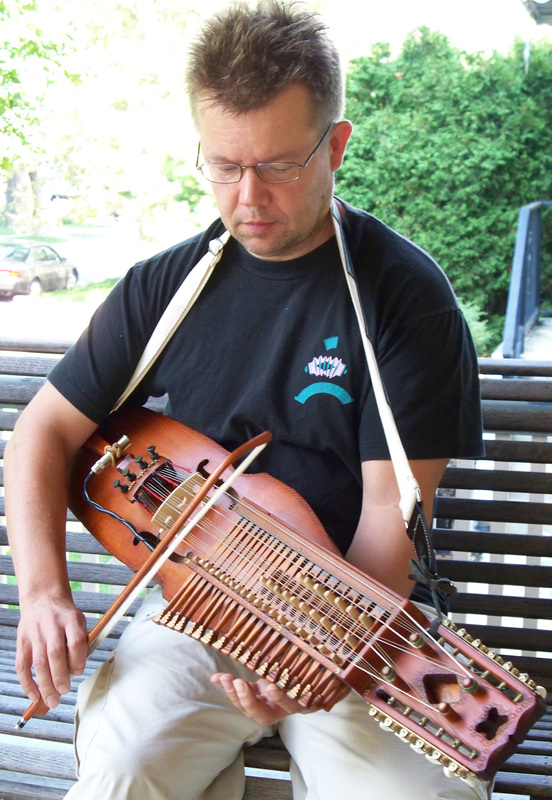 Arto will perform Finnish polskas, polkkas, sotiisis (schottisches) and more on fiddle and nyckleharpa (Swedish keyed-fiddle). Go here to download Arto’s jam session tunes. 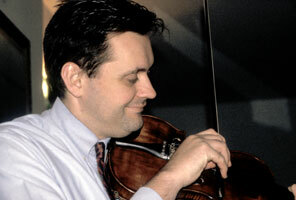 Pete Sutherland is a fiddler’s fiddle (also a master songwriter and multi-insturmentalist). 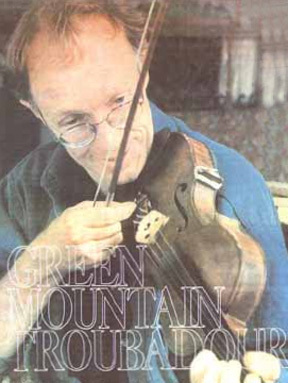 A native of Vermont’s Champlain Valley, Pete sojourned in southern Indiana during the 1980s, where your Fiddle Club convener was lucky enough to live, dance and soak up tunes. 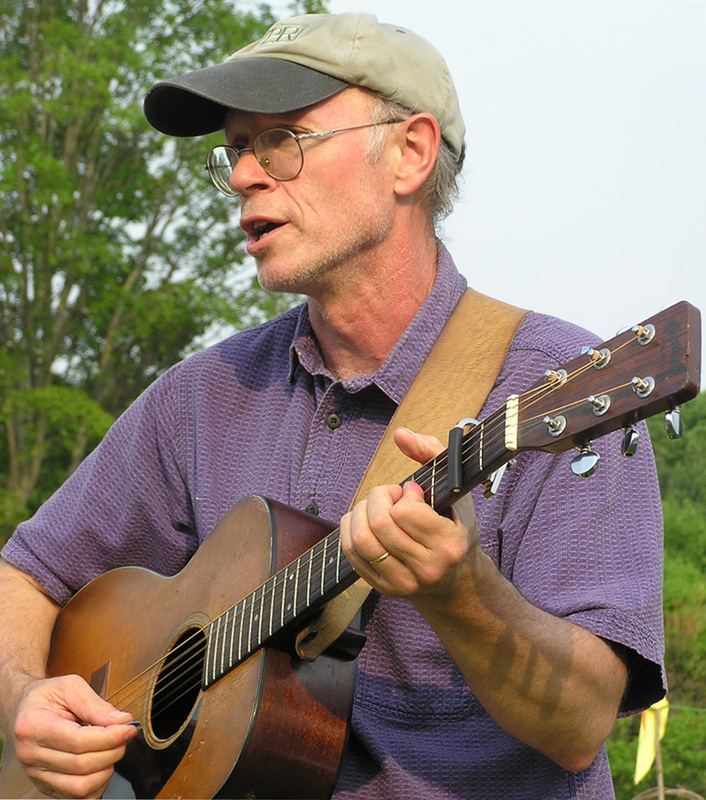 Pete’s band credits include Arm & Hammer Stringband, Metamora and the Clayfoot Strutters. Pete will be joined on his visit to the Fiddle Club by Jeremaiah McLane (piano & accordion) and Mark Roberts (flute & banjo). They are in town for a barn dance and workshops at the University of Chicago, where they will spin out more driving square dance and contra dance melodies to complete a great Fall weekend. Ruth and her accompanist, Tom Cronin, are from Newcastle, England. Chicagoland Bluegrass. Jam session tunes to be posted in October. 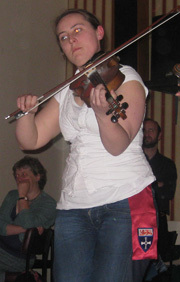 SEASON PASS for all four Fall 2009 Fiddle Club meetings is available through Sept. 25. These transcriptions of Arto Järvelä’s tunes were made by Paul Tyler as a sketch of the general melody. 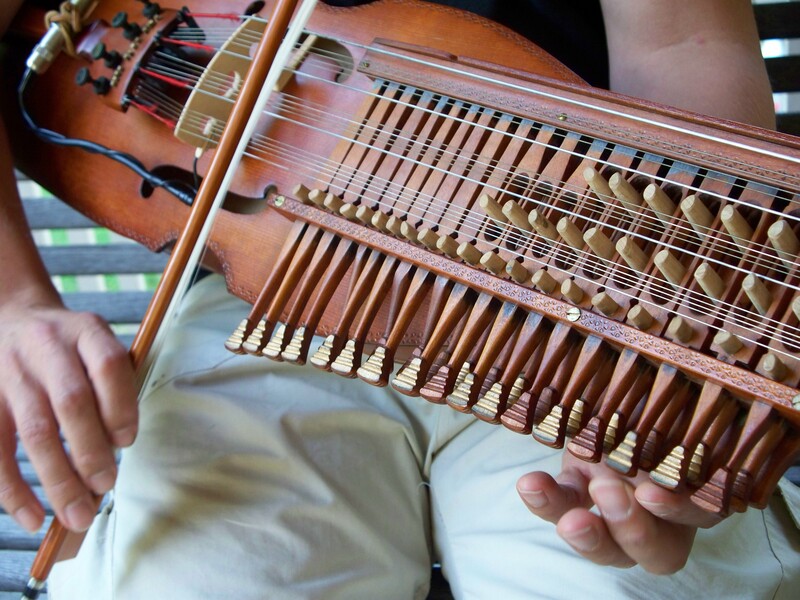 Arto’s uses more fingered and bowed ornaments, double stops and subtle variations in playing the tunes. Listen carefully to the recordings, as posted here. Arto Järvelä will be performing at the Fiddle Club of the World‘s meeting on Friday, September 25 at the Leadway Bar & Gallery (5233 N. Damen). Click here to register, or call 773.728.6000. Nota Bene: Musical notation is only a guide to one way to play a tune. Use the written notes along with the recordings. If you hear something different than what is written down, good. Trust your ears. Play what you hear. Don’t miss hearing Arto play. It is sublime. Don’t forget his appearance at the Fiddle Club of the World on Friday, Sept. 25 and the workshop on new Finnish folk fiddling on Saturday, Sept. 26, his last day here. Here are some more artistic selections for you to enjoy. Here are solo fiddle performances by Arto of three tunes we can all play together at the jam. Arto learned both the march (marssi) and polska from Elias Tallari of Kuortane, Finland. The waltz (valssi) is “efter” (from the playing of) Johan Petter Ragvals of Övermark. Peli-Jussin syömämarssi can also be heard on the CD “Arto Järvelä Plays Violin” (there is a tunebook with the same name) one of the many you can purchase from Arto during his residency at the Old Town School. Both polskas and waltzes are in 3/4 time. But it is easy to hear that they are for totally different dances. Go here to view Paul Tyler’s notation of Arto’s tunes. Arto Järvelä will be performing at the Fiddle Club‘s meeting on Friday, September 25 at the Leadway Bar & Gallery (5233 N. Damen). Click here to register, or call 773.728.6000.